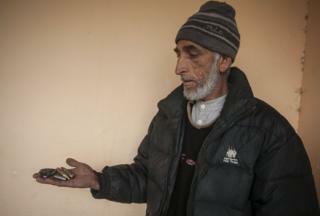 Mohammad Yaqoob, 50, barely escaped the bullets that landed inside his house in a village along the border in Indian-administered Kashmir. 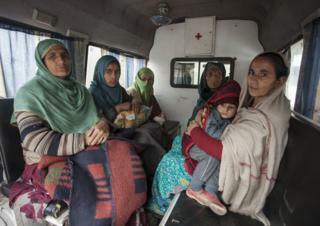 Mr Yaqoob and his family are among the hundreds of villagers who have fled their homes since India and Pakistan began exchanging heavy gunfire on 22 February, in what is being reported as an "escalation" of hostilities between the two countries. Both India and Pakistan claim Kashmir in its entirety but only control parts of it - the dispute has sparked two wars and a limited conflict between the nuclear-armed neighbours. Artillery duels were common along the 776km (482 mile) stretch that is the Line of Control (LoC) until 2003 when the two sides agreed to a ceasefire. But there has been a steep rise in ceasefire violations since 2013. "Everybody is terrified here. 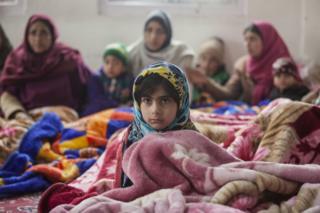 We are living under constant fear," said Mr Yaqoob, who currently lives in a relief camp set up by the local government in a school in the district headquarters, Uri. Residents of at least five border villages have been forced to leave their homes and seek refuge in the town which is surrounded on three sides by the border. 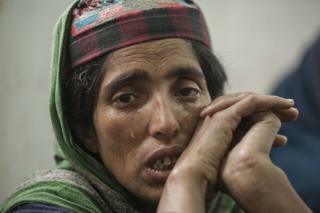 It has faced the heaviest shelling so far, affecting more than 7,000 people, officials told the BBC. Some villagers told the BBC that the latest violation is the "worst" shelling they have experienced since 2003. This woman in the village of Silikote was seen running while carrying a 10-day-old baby under her "phiran", a traditional Kashmiri dress. 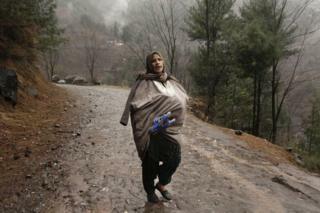 She was running towards a vehicle that was driving villagers to a camp nearby to protect them from the shelling. More than a thousand people have migrated from just three villages along the border, said officials, adding that they have arranged for ambulances to drive women and children to the camps. Villagers at the camp told the BBC that entire villages have emptied out as "everybody has left". It is unclear how many civilians have been hurt or killed because of the shelling. They are also worried about their homes, livestock and other valuables - all of which they have been forced to leave behind. Some said they came with nothing but the clothes they were wearing at the time. 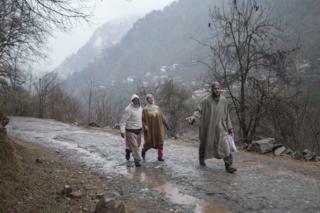 "We are living under war-like conditions and suffering," Lal Din, a resident of Uri, said. 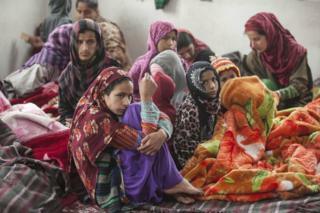 "Both sides should think of the people living along the LoC and agree to a truce." Abid Bhat is a photographer based in Srinagar.